UPDATE (7:20 PM IST) : Exodus continues from Bangalore. Till this moment approx 6800 Northeast residents have left by JAM-PACKED trains. UPDATE (6:30 PM IST) : Karnataka CM, Police Chief, politicians - "Karnataka government assures protection and security to northeast people"
UPDATE (5:01 PM IST) : There are still thousands of Northeast citizens in Bangalore Railway station waiting for trains to Northeast India. UPDATE (4:45 PM IST) : DG & IGP of Karnataka Lalrokhuma Pachuau said "There are rumours doing rounds that the northeast people in the state will be attacked by some people. But, those rumours are baseless. Not even a single case of physical assault or verbal threat them has been reported in the state. However, as a precaution, police chiefs of all districts have been directed to take necessary steps to prevent such incidents." "The state police force is ready to give fool proof security to NE students and working professionals. So, they need not panic and live fearlessly. However, if anyone gets to know of such attacks or rumours, they should inform the police control room immediately. Those who try to disturb peace will be strictly dealt with," Pachuau warned, adding he had also talked to NE leaders in the state and had assured them of safety to their fraternity. "We also had a meeting with the deputy CM and home minister, R Ashoka, in this connection. He has also instructed us to take necessary steps to avert such incidents in the state," he added. UPDATE (4:36 PM IST) : The All Assam Students Union today has blamed prominent minority leader and president of the All India United Democratic Front Badaruddin Ajmal responsible for spreading fear among students and persons of the Northeast in other states.“There is a fear psychosis among students in the states of Karnataka, Andhra Pradesh and Maharashtra as a direct result of the communal politics played by Ajmal,” AASU advisor Samujjal Bhattacharjee told reporters in Guwahati. The student body warned Ajmal “not to give communal colour to the violence in Assam” and appealed to the students not to panic and refrain from rushing back. He said at least three overcrowded trains would be reaching here from Bangalore tomorrow and that thousands of panic-stricken people were stranded in various stations of those states including Secunderabad. UPDATE (3:06 PM IST) : Congress MPs from northeast meet Sonia Gandhi related with the exodus of Northeast Students from Bangalore and elsewhere. UPDATE (2:47 PM IST) : Bangalore Muslim community will meet Bangalore district collector at 4 pm. A solidarity march is reportedly to be held at 5 pm near MG statue in Bangalore. UPDATE (2:45 PM IST) : Muslim students Hold Placards at Bangalore railway station: "Don't leave Bangalore. O! Dear Assamese friends. We love you". UPDATE (2:00 PM IST) : Muslim & Northeast community to hold Peace rally in Bangalore on August 20. This will jointly hosted by the Muslim & Northeast Communities. No word yet from Northeast Communities on who will participate. Further details awaited. UPDATE (1:17 PM IST) :Agatha Sangma, MP from Meghalaya says that the police and individual state governments should take action to ensure that nobody from the north eastern states were targeted. UPDATE (1:12 PM IST) :A doctored MMS is in circulation. Please report the MMS & SMS to nearest Police Station or call numbers below. Members of the North East Students Association met Karnataka Chief Minister where they were assured that they faced no threat in Bangalore. “Panic is justified in a small way because people have been getting messages saying that members of the community are being attacked,” a student told CNN IBN. “Rumours are more than what has happened. People have started messaging each other about these rumours,” she said. Assam Chief Minister Tarun Gogoi today appealed to students and people from Assam and other parts of the Northeast to refrain from rushing back to their home states in panic. "I appeal to students and other persons especially those who are in Karnataka and Andhra Pradesh, that they should not get panicked and (not) rush back. Rumour mongering is on, but Prime Minister Manmohan Singh has personally talked to the chief ministers of the two states to ensure security," Gogoi told reporters here. The Chief Minister made the comment in the wake of reports of mass exodus of people, particularly students, who were fearing a backlash following the widespread violence in lower Assam. He said a ministerial team would leave for Karnataka and Andhra Pradesh tomorrow and assured that there was absolutely no need to panic. "The situation is normal," he said. Asked to comment on the recent violence in lower Assam districts under the Bodoland Territorial Autonomous District, Gogoi said the situation is gradually returning to normal. "Stray incidents have been reported here and there, but one should not panic. Most of the victims have started returning to their homes from the relief camps, he said. - After Pune, Tibetan student in Mysore stabbed on suspicion he's from North East. - At least 5,000 flee Bangalore fearing Assam repercussions. -NE students exodus growing, two special trains provided from Bangalore. - North Eastern students prepared to leave Karnataka, PM calls CM. - Fearing attacks, several Assamese leave Hyderabad. Bangalore, Aug 16 : After attacks on North Eastern people in Pune, a Tibetan college student is battling for life on being stabbed in Mysore by two persons who suspected him to be from North Eastern region. Tenzin Dhargiyial (22), a diploma student of Kushalnagar College, was stabbed by two persons riding a motorcycle near a hotel in Mysore yesterday and has been admitted to Krishna Rajendra hospital in that city, they said. Meanwhile Karnataka DGP Lalrokhuma Pachau told reporters here today that police have intensified investigations to nab those who stabbed Dhargiyial and that security has been provided in and around Tibetan camps in Mysore district. Security has also been provided at two other Tibetan camps at Bylakuppe and Gurupur in Mysore district, he said. Hundreds flooded Bangalore City station Wednesday. More than 6,000 people from the Northeast fled Bangalore in panic on Wednesday following rumours that they could be attacked like elsewhere in the country, in the aftermath of the clashes between Bodos and migrant Muslims in Assam. The Bangalore City railway station was flooded with them waiting to board the Guwahati Express scheduled to leave the city at midnight. Most of them were from Assam. The Railways sold as many as 5,600 tickets for the three unreserved coaches on the train. With more people arriving at the station, a special train was scheduled to leave an hour after the express. Late on Wednesday evening, Prime Minister Manmohan Singh and Home Minister Sushilkumar Shinde spoke to Karnataka Chief Minister Jagadish Shettar and asked him to ensure the safety of people from Northeastern states. Shettar, who also got a call from Assam CM Tarun Gogoi, sent Deputy CM R Ashok to the station to assure the people travelling to Guwahati that they would be safe in the state. Shettar told PTI that police officials had also been using the public address system at the railway station to reassure the people. Karnataka DGP Lalrokhuma Pachua, who incidentally hails from the Northeast, clarified that no complaints had been filed at any police station on threats or harassment to the people from Assam. The panic came a day after a 22-year-old Tibetan college student was stabbed by two unidentified motorbike-born men in neighbouring Mysore, who apparently suspected he was from the Northeast. Although those fleeing Wednesday didn’t seem to have heard about the incident, they spoke about violence against people from the Northeast in other parts of India. Assamese were fleeing Hyderabad too on Wednesday, although the panic was on a much smaller scale and only small groups left by two trains during the day, police said. Some of the scare here was attributed to the attack on a security guard in Cyberabad last Saturday even though it was not related to the clashes in Assam. The hundreds of Assamese at the Bangalore railway station, mostly men in their 20s and a handful of families, were leaving construction, security, retail and office administration jobs after the panic triggered by word of mouth over the last few days. “There have been attacks on people from Assam and the Northeast in different parts of India. People are saying there will be attacks in Bangalore as well after Ramzan. There were reports of some people from Assam being troubled in one part of Bangalore. We want to go back to our families,” said Ranjith, 22, who worked at a retail outlet after arriving in the city about a year ago. “We have spread the word among all our friends. It may be a rumour but we don’t want to take a risk. We want to be with our families in Assam at such a time. We will see the situation for a while and decide if we want to come back,” said Ripen, 21, a friend and colleague of Ranjith. Some at the station claimed the government of Assam had sent out a message asking all Assamese to return. “Our government has asked us to return. Our employers and landlords in Bangalore have suggested we go back if we apprehend danger,” said Mitra Lal Upadhyay, a security labour contractor who claimed he was sending 40 boys back to Assam as they feared for their lives. An office boy and security guard at a private firm for nine years, Jayanth, 27, said he was going back because his family was panicking over news of attacks on Assamese people and the violence in Mumbai was a factor as well. Some employees referred to direct threats of violence after Ramzan being made to them, others referred to an alleged video of a brutal attack in Assam being circulated among Muslims for which reprisals are being planned, while still others referred to alleged warnings from the police itself. The Bangalore police however claimed they had not initiated any measure asking people from the Northeast to move out of the city. The police seemed unaware of the situation until senior state intelligence officials visited the railway station. “People from Assam are going back home for the festival period, that is why they are present in large numbers,” a police official at the railway station said. In Hyderabad, Kiran Tiwari, director of a security agency that employs hundreds of people from the Northeast and Orissa, said that some of his employees told him they received calls and text messages saying they would be attacked after Ramzan. “I think someone is trying to create mischief and scare them. Some of my staff asked to go home after they received calls from other employees but all of them chose to stay back as of now. I believe it is more about a scare due to everyone calling each other rather than a specific threat from anyone,” Tiwari said. Some Bodos who work in restaurants in the city left last week as they were concerned about their families back home due to the violence there. Hyderabad Police Commissioner Anurag Sharma said that the police were trying to probe the origin of the rumours. But there were no attacks on people from the Northeast, he added. Bangalore: Gripped by panic following rumours of attack on some of their compatriots, about 5,000 people of North Eastern states, including students, on Wednesday prepared to return to their home towns even as Karnataka Chief Minister Jagadish Shettar assured them of security. Prime Minister Manmohan Singh and Home Minister Sushil Kumar Shinde spoke to Shettar on Wednesday night and were understood to have asked him to ensure the safety of people from North Eastern states in Karnataka. The Bangalore City Railway station was flooded with people from North Eastern states to board the available trains as rumours spread that some people from the state had been subjected to attacks in the city, which was promptly denied by police. Shettar said that he told the Prime Minister and the Home Minister that "there is no untoward incident nor is there any threat to people of North Eastern states. I promised that necessary steps would be taken to give protection to these people". In the wake of abrupt exodus of passengers, the South Western Railway decided to run a special train. Shettar assured protection and deputed Deputy Chief Minister R Ashoka, who also holds Home portfolio to instill confidence in the panic-stricken people and convince them not to leave the city. The Chief Minister said police officials have been using public address system at the railway station to reassure the north eastern people gathered there and assured them protection. Shettar said Assam Chief Minister Tarun Gogoi also spoke to him over phone and he assured him that all possible assistance and protection would be given to his state people. Earlier on Wednesday, Karnataka DGP Lalrukuma Pachau, who also hails from the North East, said interest of these people would be protected and their safety ensured. In Mysore, a Tibetan college student is battling for life on being stabbed in Mysore by two persons who suspected him to be from North Eastern region. Atleast 5,000 people from the north east, including students, have left Bangalore in two special trains for Assam fearing repercussions of the recent Assam violence, VS D'Souza nodal officer appointed by the Karnataka police said on Wednesday. Speaking to Hindustan Times, D'Souza said that no complaints have been registered at any police station across the state. "No complaint has been registered at any station, we have directed all our officers to be alert." Special train services may also be put in place on Thursday as well. D'Souza also said that there is no police intelligence on any attacks. "People are fearing repercussions of the Assam violence. We have assured them all action will be taken." Following attacks on people from the northeast in Pune as a fall out of Assam violence, the state police have geared up to ensure no such incidents takes place in the state. Two special trains have left Bangalore and around 5,000 have left the city. State home minister R Ashoka went to the railway station and tried to convince them against leaving the city. He made an announcement from the railway control room saying they should not believe rumours. He also assured protection to them. Prime Minister Manmohan Singh and Assam chief minister Tarun Gogoi spoke to Karnataka CM Jagadish Shettar and Shettar has aasured them of protection to the people from the northeastern states. Union home minister Sushilkumar Shinde also spoke to Ashoka. The state police chief Lalrokhuma Pachuau rubbished rumours of any such attacks in Karnataka. "There are rumours doing rounds that the northeast people in the state will be attacked by some people. But, those rumours are baseless. Not even a single case of physical assault or verbal threat them has been reported in the state. However, as a precaution, police chiefs of all districts have been directed to take necessary steps to prevent such incidents," DG & IGP Pachuau said at a press conference on Wednesday. Meanwhile, city police commissioner, BG Jyothiprakash Mirji, said that the rumours were being spread through text messages and social networking sites. "There are more than 2.5 lakh NE population in the city and most of the them are students. We have identified the places where they are thickly populated and have intensified patolling in such areas with immediate effect. DCPs and ACPs have been asked to meet NE people in their limits and to interact with them regularly." Following the rumours, nearly 3,000 left the city on Wednesday afternoon. Mirji admitted it and said that most of them returned to their home states through train. "The policemen spoke to them and it is learnt that most of them have returned to pay a visit to their house as some of their family members and relatives were injured in the violence. But, some have returned fearing that they would also be attacked in the city. However, there is absolutely no reason to panic as the police have taken all possible steps to prevent such attacks," he added. Impact of the recent violence in Assam targeting refugees from Bangladesh is being felt in Hyderabad with some Assamese working as private security guards here rushing back to their State worried over possible retaliatory attacks. Though no official statistics are available, many Assamese security guards deployed at malls, restaurants and software companies have stopped turning up for duty leaving their managements clueless. “They didn’t take our calls. A few of them who spoke reluctantly said the situation in Hyderabad was not good,” Vishwajeet, manager of a noted security agency said on Tuesday. They, however, assured him that they would come back “once things improve”. Speculation was rife for the past two days that activists of some religious organisations were enquiring about Assamese living in different parts of the city. The Hyderabad Assamese Association former president Sarbeshwar Sahariah says over 10,000 Assamese are living in Hyderabad. A good number of them work as guards with private security agencies. “It is said that one person from Assam travelling in a train was beaten up by unidentified persons somewhere in Andhra Pradesh days after the violence broke out in Assam,” he said. He felt this unconfirmed report naturally worried Assamese living in Hyderabad. Meanwhile, rumours began doing rounds that Assamese guards were beaten up in Madhapur and Gachibowli areas - hubs of IT company offices - by unidentified persons. Two days ago, a person from Assam walking alone on the road was allegedly intercepted and beaten up by three unidentified persons in Raidurg, who snatched his mobile phone. Police conceded that they deliberately didn’t divulge details of the case to the media apprehending that it could create panic and may lead to communal tension. Police are trying to identify the attackers based on the details given by the guard. Interestingly, the incident was not taken seriously by some Assamese guards working in central parts of the city like Somajiguda. “I heard that some have left. But we have no such fear here and hence not worried at all,” Hari working at a restaurant in Begumpet said. Managers of some private security agencies say there was more to the sudden quitting of jobs by the guards than what meets the eye. Some guards reportedly revealed that they quit the jobs at the instance of a local MLA from Assam who directed them to leave the jobs at once and return to the State. “We’re hoping to hear from them soon,” the manager said. Migrants workers from Assam and other northeast states, getting ready to leave at Bangalore City Railway station in Bangalore on Wednesday Photo: K. Murali Kumar. “There is no threat to the people of the north east in any part of the country,” Mr Singh told PTI here reacting to reports that people from the region were attacked in other parts of the country. On reports of mass exodus of people from the north east living in Bangalore, Mr Singh said he had spoken to the Chief Secretary and Director General of Karnataka Police and they had informed him that there was no incident of attack on anyone from the region anywhere in the state. “Last night when I got an information that some people from Assam were under threat in Karnataka, I rang up the DGP and checked up with him... There is nothing. “When people thronged the (Bangalore) railway station to go to the north east, the Home Minister of Karnataka himself went there and told them that there is nothing. So the rumour mongering has to be stopped. Some people are spreading rumours,” he said. As over 5,000 panic-stricken people from North Eastern states fled the city after rumours of attacks targeting the community spread, Karnataka Chief Minister Jagadish Shettar is holding a high-level meeting on Thursday to tackle the situation. Two Assam-bound special trains were operated late on Thursday night in addition to the regular service to clear the sudden rush of passengers triggered by the rumours in the wake of some attacks on North Eastern people in some parts of the country in the Assam violence backlash. The stabbing of a Tibetan student by two motorcycle-borne men in Mysore on August 14 added fuel to the fears of the North Eastern people whom the Government and Police are trying to convince that they are safe in the state. However, State DGP Lalrokhuma Pachuau, who himself is from North Eastern state of Manipur, said on Thursday that the exact number of people who fled the city was not known as many bound for Guwahati were regular passengers, and not those leaving following the rumours. Concerned over the development, Prime Minister Manmohan Singh himself spoke on Wednesday to Mr Shettar who assured him that steps were being taken to give protection to the people from the North East. Besides Dr Singh, Home Minister Sushil Kumar Shinde and Assam Chief Minister Tarun Gogoi also spoke to Mr Shettar on the issue. Sources in the Chief Minister’s Office said that Mr Shettar would discuss with the officials the exodus and find solutions to tide over the fresh problem. A small group of people at the railway station said, “We are expecting the railway authorities to make an announcement of arranging special trains to Guwahati. We want to be with our families in Assam. We have been informed that some people are planning to attack us as our community was attacked in Mumbai and other parts of the country. “We do not want to take any risk as nobody comes to our rescue when we are attacked,” Monica and others from her region said in unison as they waited at the railway station this morning. Railway officials had said yesterday that they had sold more than 5000 tickets for northeast destinations. 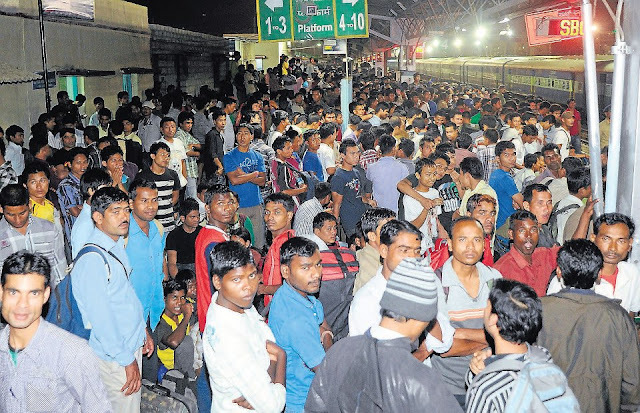 The City railway station on Wednesday night was witness to unprecedented rush as hordes of people of North Eastern origin boarded trains to Guwahati, in a panic-ridden state. The Bangalore division of railways had to organise two special trains in addition to the regular train to Guwahati. Chaotic scenes were witnessed as people struggled to board the trains between 11 pm and 12 am, when all the three trains were scheduled to depart. Home Minister R Ashoka rushed to the station and tried to assure people that there was no threat and it was all rumours. This assurance did not, however, satisfy the emotional crowd as they resorted to sloganeering and shouting. Railways police and additional police were present in huge numbers at the station. Each of the coaches are being provided with two policemen till the Andhra Pradesh border. DCP (West), S N Siddaramappa, told Deccan Herald: “I visited the City railway station where about 4,000 people have gathered to leave for Guwahati by a special train. I addressed the people through the public address system and requested them to come forward with any specific complaints and co-operate. Most of the people the Deccan Herald spoke to refused to be identified, but said they had been told to leave within ten days. A resident of Koramangala said that some people had visited their house and issued the threats. “We cannot ignore these threats. Now my parents are insisting that I go back,” he said. Even Nepalis are a part of the crowd which is exiting the State by the minute. Pradhan, a Nepali said he was sick of the harassment faced in the last 4-5 days. “I have been so miserable. Some people came to my door and told me to leave,” he said. Rohim from Assam who is travelling back home with two of his friends had a different story to tell. “Everybody here is telling me that they are fleeing expecting violence, but I am going back with my friends, because my people want me to come back to help them after the violence with Muslims,” he said. A student from Sikkim claimed that an autorickshaw driver “kind of threatened me” when he was travelling to college on Tuesday. During the journey, the driver asked him whether he knew anything about the violence in Assam. “Aap logon ke jaane ka waqt aagaya. Ramzan ke baad chale jaana,” (It’s time for you people to leave the City; you should go after Ramzan) the student, who preferred anonymity, quoted the driver as saying. He says the driver did not shout at him but his tone sounded “kind of a threat”. Bangalore cops scotch rumours as northeast students flee. Wild rumours have been spreading, causing panic, that the people from the northeast region would be attacked after the Id-ul-Fitr August 20 to avenge the Assam violence, in which 74 lives were lost."